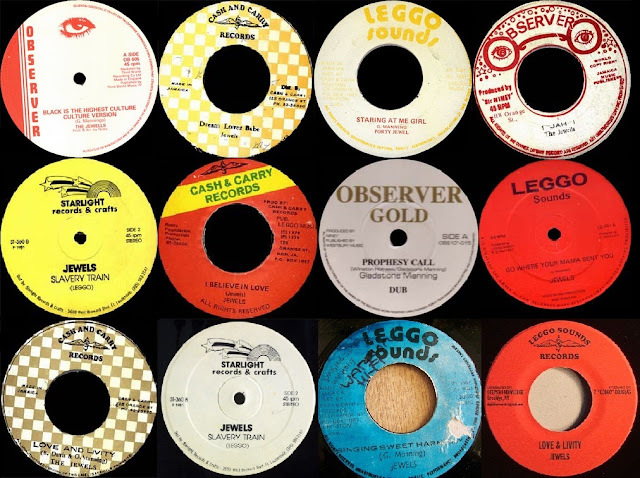 The handful of records from The Jewels released towards the latter part of the '70s are among the final flourishes of a long standing tradition in Jamaican popular music. The vocal group is a constant in the island's recorded music that extends back as far as the pre-ska Jiving Juniors and The Maytals, though it is during the rock steady era in the mid-'60s when the style comes properly into its own and provides much of the more memorable sounds of the time. Similarly, during the Ras Tafari resurgence of the '70s, the style is adapted by former rock steady outfits like The Wailers, Gladiators, Ethiopians, etc and newer groups such as the original Burning Spear, Culture, The Abyssinians and many more. With the advent of the dancehall genre in the '80s the solo singer has moved back into the ascendant and the vocal group all but vanished from the scene. The first of the Jewels collection is itself a solo effort: Prophecy Call recorded by Glassford Manning, produced by the Sir Niney and issued in JA on the Observer imprint is a sufferers plaint rendered in the manner then favoured by the Freedom Sounds roster of artists operating out of Greenwich Farm in Kingston. When I later ask Niney for details concerning this obscure side, he tells me that Manning is the lead singer of a vocal group, The Jewels, he has been recording, and shortly after this the first of the group's waxings surface in the London pre outlets: Jah I, credited to The Jewels and again released on Observer. This first group effort is an ehortation in defence of Ras Tafari propelled along by the double drumming recently popularised by Sly. "Although the wicked they try to cramp 'gainst I and I", Manning warns, "they shall stumble and fall." The fourfold rhythm is expounded to even greater effect on the dub I Jah as performed by The Observer Wild. The song duly forms the A-side of their sole UK issue, on Observer discomix through the auspices of Count Shelley's Third World centre, and couple with a further Jewels title unissued in Jamaica, called Black Is The Highest Culture. Their next and final three releases mark the group's sudden shift of allegiance from Niney to Leggo Beast's Cash and Carry label. The first of these, Love and Livity, is the Jewels' single gem. Penned jointly by B. Davis (presumable Bobby Davis, former singer with The Sensations rock steady vocal group) and Glassford Manning, the song is a lilting, humanitarian hymn with weaving harmonies, which harkens back to the rock steady style. Big Youth was moved sufficiently to toast a version. Dream Lover Babe, which followed, was again evidence of the group's gentler side, and once more its debt to rock steady is marked in both use of harmonies and production. A dignified piece. Their last was Slave Trade credited to just Jewels and released in 1979 on a new Cash and Carry imprint, with some polemic detailing inquity under the yoke as its title suggests. "They treated us with brutality, and they treated us with no humanity," are the last words from The Jewels as the song fades. Since when a silence. Except for a single footnote: a solo effort released in 1981 on the Beast's eponymous Leggo Sounds label from one Porti Jewel entitled Staring At Me Girl, a further G. Manning composition. Are Porti and Glasford one and the same man? The vocal suggests as much. Thank you very much for this ! I've got exactly the same experience than you, listening to the radio show Hidden Gems - The Jewells by the Australian Reggae website firecorner.com and falling immediatly in love for this sound and for Glasford Manning amazing voice & feeling. Hi, I just receve my first 7" of the Jewels "Love & Livity" ! This track is now in my top 10 ! Can someone help to find or to give me the lyrics of this tune 'cause it's a little hard for a frenchy to understand all. Thanks for your help !